Investors were ready for the long weekend, and it showed. Trading meandered around the breakeven mark for much of the day. Volume was light. The Dow fell more than 50 points this morning, but by the afternoon it was up more than 30 points. In the end the Dow finished with a modest loss while the S&P 500, and Nasdaq both had modest gains. For the week the Dow and Nasdaq were up more than 2% and the S&P was up nearly 3%. But today's rally masked the drama going on in some individual stocks. Both IBM (IBM) and Google (GOOG) reported weaker than expected earnings last night, and they're being punished for it. "The market is rewarding the companies that are making their numbers on the top and bottom lines and punishing others that don't give positive guidance and top line growth," said Quincy Krosby market strategist at Prudential Financial. IBM (IBM) fell more than 3%. The "old tech" bellwether was a refuge when the momentum stocks relentlessly sold off last week, but not today. On StockTwits, opinion was split on IBM. LittenThomas said,"$IBM It's hard to imagine this stock would get a bid today. There's so much wrong with this company and job layoffs aren't going to fix things." But tickertutor countered, "$IBM All that money POURED in during the recent tech route. Others are getting a great opportunity to buy in right here." Google (GOOG) was also down more than 3%. Ad volume surged 26% in the most recent quarter. While that would be impressive for just about anybody else, Wall Street is now conditioned to see anything less than spectacular as mediocre when it comes to Google. Related: Google's ad prices are down. So what? As for the market as a whole, Ed Yardeni, president and chief investment strategist at Yardeni Research, said that traders moved into neutral positions before the long weekend..
"Traders want to enjoy the weekend and not have to worry before they get back to work," he said. Markets are closed tomorrow in observance of Good Friday. 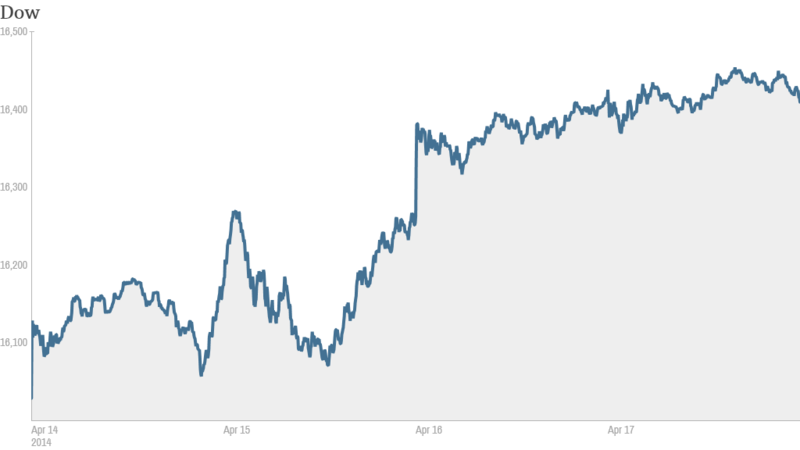 General Electric (GE), a stock many see as a proxy for U.S. business, finished the day with a gain of nearly 2%. G.E. released earnings this morning that were better than Wall Street had expected. Momentum favorite Netflix (NFLX) also closed sharply higher, up more than 4%. That helped cut its losses so far this year to 6%. One technology company finishing the week with a bang: Sandisk (SNDK). It's surged nearly 10%. The memory chip maker for smartphones beat earnings and revenue targets for the first quarter. Sandisk also said it's boosting its gross margin expectations for this year. DomDom said,"Moral of the story? When $SNDK execs say the exact same thing as $MU, people listen." Sandisk (SNDK) competitor Micron Technology (MU) recently told a similar story about memory chip demand in its latest earnings release. In fact, DomDom thinks Sandisk (SNDK) management does a better job on conference calls, "Can we hire $SNDK management to run $MU conference calls? Communication = Stock Confidence." But investors seemed to have had their fill with one stock: Chipotle (CMG). The stock surged 5% this morning, but finished lower. The restaurant chain missed earnings estimates but revenue came in higher than Wall Street had predicted, a sign that folks braved the wind and snow to get their burritos. Banks are another bright spot today. Goldman Sachs (GS) gained after strongly outperforming Wall Street expectations. Investment banking revenue the highest since 2007. Fellow financial Morgan Stanley (MS) also had a had a good day after reporting that first quarter earnings surged 63% and revenues grew 10%. Retailer Sears Holdings (SHLD) was also up sharply after an SEC filing shows that board member Thomas Tisch recently bought 475,000 shares. China's Weibo (WB) jumped nearly 20%. It debuted on the Nasdaq today, but the microblogger had to cut its offering from 20 million shares to just under 17 million shares, raising less money than expected. The company is being watched closely as a litmus-test for China's Alibaba, which is expected to start trading in the U.S. in the coming months. Alibaba is a hybrid version of Amazon.com/eBay for the world's second largest economy. mdcorey said the fundamentals of the marketplace look good for Weibo (WB),"$WB China has 2X as many Internet users as the U.S. and currently just 1/2 the U.S. Internet penetration. Massive growth ahead." In Europe, rising tensions in eastern Ukraine were adding to the unsettled tone. European, U.S., Russian and Ukrainian officials met in Geneva to try to find ways to resolve the crisis. President Obama has warned of new sanctions against Russia if talks fail. European markets closed slightly higher. China GDP data published Wednesday showed the world's second largest economy is slowing, but not as dramatically as some had feared. Asian markets ended mixed.